Potomac Lodge No. 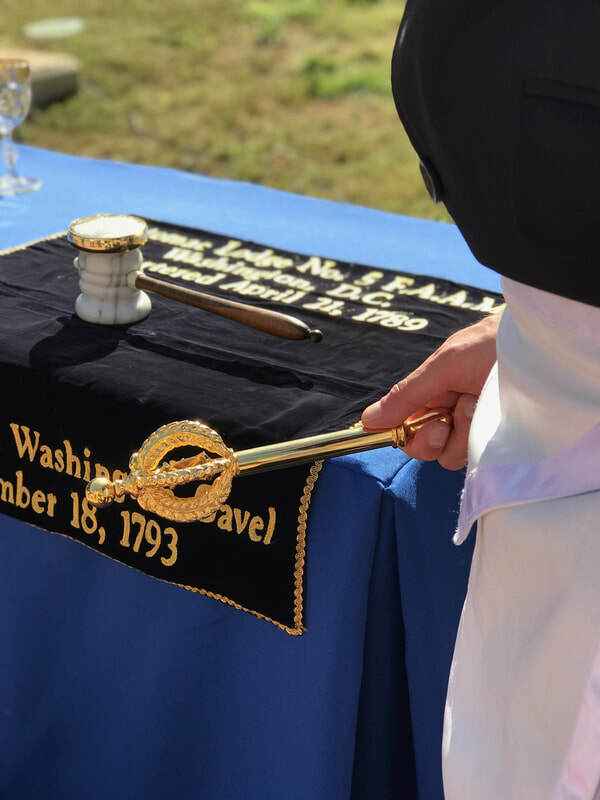 5 continues to perform ceremonial cornerstone layings with the George Washington Gavel, and also offers educational programs on the Gavel’s history. If you would like to request the Gavel’s presence at your event, please contact us via postal mail, addressing your letter to the following address. Potomac Lodge No. 5, F.A.A.M. Describe your event and how the Gavel will participate in it, being sure to include all relevant dates and times that the Gavel’s presence will be required. Please also send an email to secretary@potomac5.org in advance of your written request in order that we may review it in the most timely manner possible. For programs within 3 hours driving distance of Washington D.C.. please submit your written request no less than TWO months in advance. For programs more 3 hours driving distance of Washington D.C. or requiring air travel, please submit your written request no less than SIX months in advance. The Gavel must be accompanied by a minimum of two (3) members of Potomac Lodge No. 5 at all times. If multiple presentations or extended display hours will be required, a larger Gavel Committee may be necessary. Due to the Gavel’s age, Potomac Lodge No. 5 no longer permits its handling or actual use in ceremonies by anyone other than the trained Gavel Committee. Finally, please remember that the Gavel is accompanied at all times by volunteers from Potomac Lodge No. 5. Although no fee is charged for the Gavel’s presence, it is customary to reimburse the Lodge for costs associated with the Gavel’s appearance, such as travel, food and lodging costs. Your expectations in this area should be detailed in your letter to the Lodge. Thank you for your interest in the George Washington Gavel; Potomac Lodge No. 5 considers it an honor to safeguard this important piece of history, and looks forward to the opportunity to share it with you and the other attendees of your event.